So you’ve done your research, purchased a CMMS, watched all the training videos, and you’re ready to start tracking, organizing, and scheduling your maintenance operations using your new software. Now comes the easy part, right? It’s a fact no one wants to address: CMMS implementations can go very, very, wrong. Whether it’s poorly executed training, misconfiguration of the system, or the resistance of the team to adopt the technology, it can seem like there are a number of reasons for an organization to fail to successfully implement a CMMS. 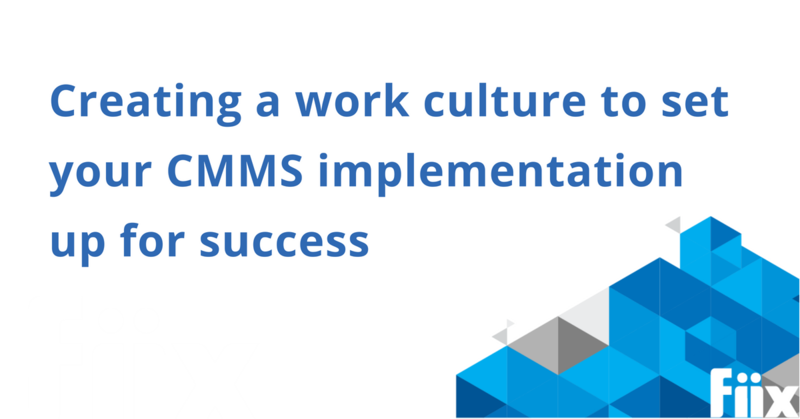 However, at its core, CMMS adoption failure comes down to one thing: a culture problem. That is, if your organization doesn’t foster a work culture that will embrace the adoption of a CMMS, you’ll have a hard time getting it up and running successfully (even if you have the best intentions). Thankfully, according to John Cray of Life Cycle Engineering and the Asset Reliability @ Work podcast, there are a number of measures you can take to ensure your organization has the right culture in place to support the implementation of a CMMS. No work order, no work. All work that is completed should be recorded in a work order and captured in your CMMS. If there is emergency work done, technicians should respond to the emergency and then document it in a work order after the fact. This will eliminate any ambiguity surrounding whether a job requires a work order and get people used to the habit of tracking all work. All spare parts should be tracked with a stores item number. All materials (stocked or non-stocked) should be identified with the appropriate information to reorder. This will allow your organization to get used to tracking all inventory and easily reorder parts that are needed. Practice the 400% rule. What does that mean? Put simply, 100% of internal labour, 100% of your materials, and 100% of your contractor costs should be documented on a work order 100% of the time. The purpose of this is to create an aspirational standard that will again eliminate ambiguity as to what should be recorded in your CMMS. All equipment failures should receive a root cause analysis. When an equipment failure occurs, you should be asking “what failed, and why did it fail?”. Your root cause may require you to engage an engineer or a whole team of people to address. This will help you see the kinds of root causes that come up for your maintenance team, and start to form further guiding principles for how you will address each kind of problem. What happens after these guidelines are established? Once you’ve stood up a culture that supports these guiding principles, Cray posits that there are a few more steps to complete. Set official processes and business rules. These should be established and reviewed by a small, cross-functional group to create a standard the organization can work towards. These will drive the development of training materials. Put a great communications plan in place. The first part of this is preparing your management staff for implementation. Do they know why they’re implementing a CMMS? What’s the benefit of maintenance management software? What is and isn’t changing with the adoption of this software? Management should be able to effectively answer the questions, “What’s in it for me?” and “How will this affect me?” for every employee. Training that’s conducted should be able to address this information for everyone involved. Recognize and reward new behaviours that come out of implementing the new CMMS. Change takes time and concerted effort on all fronts, so make sure you’re rewarding the behaviour you want to continue to see from those who are using the CMMS. Positive reinforcement goes a long way. You’ve successfully implemented your CMMS… now what? Once you have everyone on board and following the guiding principles that have been put in place for successful implementation, it’s time to focus on metrics, says Cray. He recommends setting up a dashboard of leading and lagging indicators that will influence and steer your culture in the right way. For more in-depth information on this topic, you can read John Cray’s article in IndustryWeek or listen to the full Asset Reliability @ Work podcast. Or check out our blog on the change management tips you need to know before updating the technology in your facility.